The DVD cover of this documentary best illustrates both its subject and its tone. Mohamed Nasheed, president of the Maldives, stands with his hands behind his back, wearing a suit and tie, in the middle of the ocean with water up to his knees. 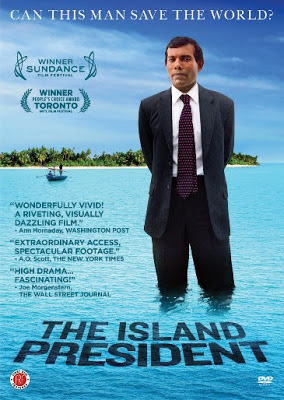 The tagline “Can this man save the world?” refers to Nasheed’s quest for carbon neutrality in his country and a worldwide drive for a reduction in carbon dioxide emissions that can combat global warming. Jon Shenk’s film portrays Nasheed as an ambitious trailblazer with an optimistic resolve, making him an endearing, lively subject for this hard-hitting and enthralling documentary. “The Island President” focuses on the events leading up to the Copenhagen Climate Summit in 2009 and Nasheed’s role in the conference. Nasheed is firmly established as the main character of the story, with his country of islands as the supporting player. The film opens with straight narration by Nasheed, allowing him free reign to speak passionately about his country without being prompted by onscreen questions. His description of the country as not having even one hill and a place where the very rich come to relax, accompanied by astounding aerial, beach, and ocean shots, paints a beautiful picture of his nation and establishes a firm emotional foothold for ensuring that it does not sink into the ocean. Nasheed’s energetic attitude and sunny disposition are sharply contrasted by the tales he and other former political prisoners tell about the state of the Maldives prior to his election in 2008, when Mamoun Abdul Gayoom ruled as president for thirty years and torture was commonplace. Nasheed confronts this ugly past with a wonderful sense of humor, laughing when a reporter tells him during his candidacy that Gayoom needs just five more years to achieve democracy, responding with a smile on his face that he has already had thirty years. Nasheed seems inherently likeable, excitedly taking phone calls in the middle of cabinet meetings and exuding an all-around positive demeanor. The arguments presented in “The Island President” are most compelling because of the passionate way in which Nasheed invokes and articulates them. He emphasizes the undeniable existence of global warming and the importance of supporting democracy in an Islamic country. 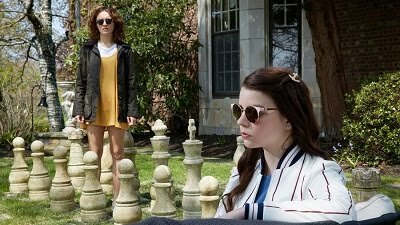 Though the film’s events take place in 2009, they feel especially relevant now on both levels after the U.S. damage from Hurricane Sandy and the continued violence in Islamic countries. The film’s effect is only slightly dampened by the end credits addition that notes Nasheed’s forced resignation, supposedly at gunpoint, from the presidency in 2012, a subject that deserves an additional documentary. Prior to that unsatisfying unending, however, “The Island President” is an informative, important, and entertaining piece of nonfiction filmmaking.